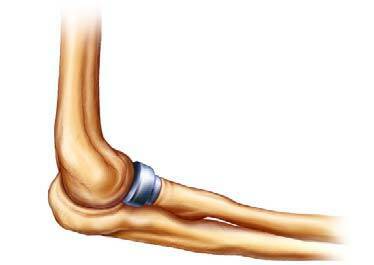 The olecranon is the bone at the tip of the elbow that the triceps tendon inserts into. It is an area of the elbow that is commonly fractured / broken during a fall. Olecranon Fractures that are non-displaced (i.e. cracks in the olecranon without separation of the fragments) are fairly uncommon in adults, but are more common in children. Non-displaced Olecranon Fractures are treated with 3 weeks of casting followed by light use for 3 more weeks and physical therapy if necessary to regain motion. 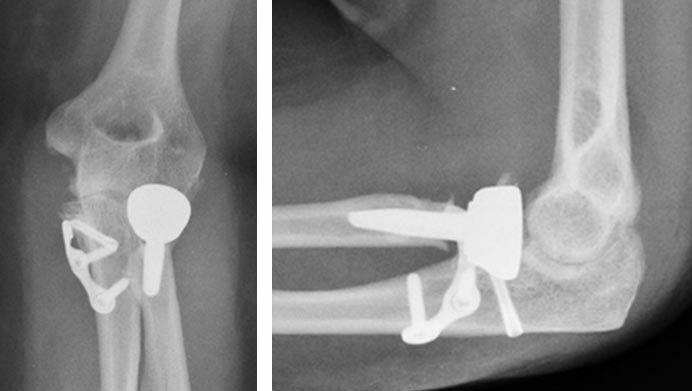 Displaced Olecranon Fractures, where the fragments have separated, require surgery in order to restore elbow function. The triceps tendon, the only tendon that extends the elbow, attaches to the olecranon. Failure to fix the Olecranon Fracture means that triceps function will be permanently compromised. Olecranon Fractures may also disrupt the smooth surface of the elbow joint and lead to arthritis. All of these problems are minimized by surgical treatment. 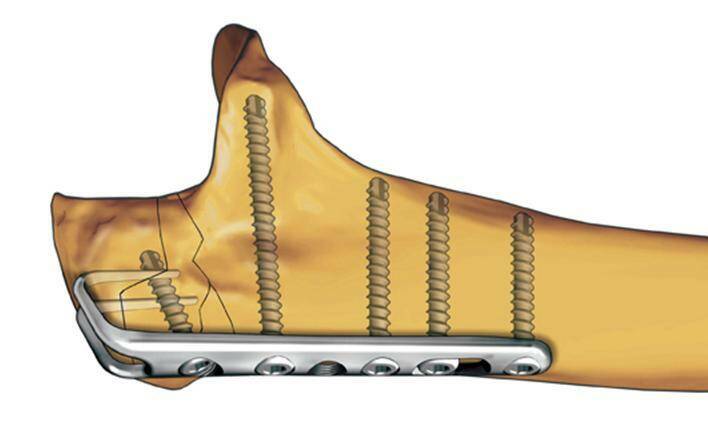 There are many fixation devices that can be used to treat olecranon fractures, but I believe that specially-designed locking plates are currently the best fixation available. Newer plates have very low profiles and rarely cause tenderness. In addition, they provide stronger fixation with a shorter structure, allowing for shorter incisions and less surgical dissection. These plates have a low complication rate and are stable enough to allow for early motion. Olecranon Fractures usually do very well following surgical fixation. 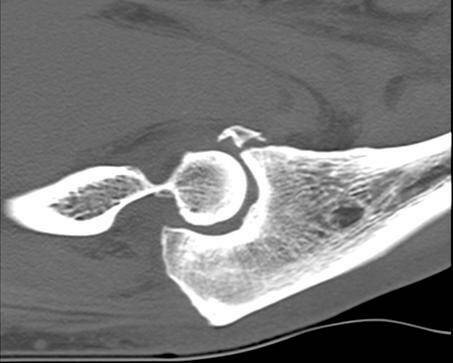 Coronoid Fractures are rarely isolated injuries to the elbow. Coronoid Fractures are usually associated with other elbow fractures and ligament injuries. Coronoid Fractures can be an important part of very serious elbow injuries, such as the ‘Terrible Triad’ injury, which includes a fracture of the coronoid, a fracture of the radial head, and a tear of the lateral collateral ligament. These and other complex elbow injury patterns usually require surgical fixation to have the best chance of optimizing future elbow function. These complex injury patterns do best in the hands of Orthopedic Upper Extremity or Elbow Surgeons, who are sub-specialists with the advanced training and experience necessary to treat these complicated injuries. Having lectured nationally on these injuries and having performed original research on the optimal way to fix large Coronoid Fractures, I can tell you that their treatment can be quite complex. If the Coronoid Fragment is small it is usually fixed by strong sutures. If the Coronoid Fragment is large, it is usually fixed with a special plate; a screw may be added for additional stability. While Coronoid Fractures are serious injuries, in the hands of an experienced Orthopedic Upper Extremity or Elbow Surgeon with a committed patient and therapist, the surgical results are often very good. 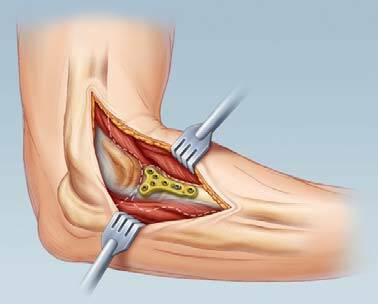 Radial head fractures: Radial Head Fractures are the most common fracture of the elbow. Radial Head Fractures vary from being minimally-displaced fractures (the bone fragments haven’t moved) that are treated without surgery, to intermediate severity fractures that require surgical fixation, to fractures that are so bad that they won’t heal even if they could be fixed; these radial heads need to be removed and replaced with a metal radial head. Most commonly, Radial Head Fractures are minimally displaced (i.e. not moved very much). While minimally displaced radial head fractures don’t require surgery, they can still lead to significant elbow stiffness and loss of forearm rotation. In fact, the most common complication of radial head fractures is, by far, elbow stiffness. Many generalists or emergency room physicians have a knee-jerk reaction, and splint all fractures. And while there’s nothing wrong with splinting these fractures for a few days, if the elbow is immobilized for over a week or two it becomes much tougher to regain full motion. Permanent elbow stiffness may result. Any splinting for a minimally displaced elbow fracture should be removed within 4-5 days and early motion begun to avoid permanent elbow stiffness. In order to help regain motion, the blood clot inside the joint can be aspirated (sucked out with a needle) to decrease the internal joint pressure, decrease pain and make it easier to move the elbow. This is analogous to letting some water out of a water balloon to make it easier to bend. To ensure optimal motion, physical therapy is often prescribed. Some Radial Head Fractures are displaced or comminuted (many pieces) and require surgical fixation or even replacement with a metal radial head. This is where it’s very important to be seen by an experienced Orthopedic Upper Extremity or Elbow Surgeon, as the more severe Radial Head Fractures are often associated with Lateral Collateral Ligament injuries, Medial Collateral Ligament injuries and Coronoid Fractures. The associated Coronoid Fracture and the ligament injuries will also require fixation in order to attain a good result. Bad Radial Head Fractures may even be associated with severe ligament injuries about the forearm and wrist. If these associated injuries are missed or ignored, the initial surgery may not be sufficient, and further complex reconstruction surgeries may be required to salvage the elbow. Future problems, such as permanent elbow and forearm instability, pain, stiffness, weakness and decreased function may result. If the Radial Head Fracture is displaced and in only 2 or 3 pieces, it is usually best to fix it with screws, if possible. While plates are sometimes necessary, plates often lead to pain, stiffness and swelling, and are usually removed after 4-6 months. Radial Head Fractures that break the head into 4 or more pieces will do better with a Radial Head Replacement. These metal replacements help provide stability to the elbow. Subspecialty knowledge and experience is extremely important here. While Radial Head Replacement may appear straightforward to many surgeons, it is quite common for inexperienced and/or non-sub-specialist surgeons to ‘overstuff’ the elbow joint by implanting a Radial Head Replacement that is too large, leading to elbow pain, stiffness, weakness and arthritis. More experienced Upper Extremity or Elbow Surgeons are far less likely to make this technical error. For either Radial Head Fracture fixation or replacement, it’s best to start motion early, within a week after surgery, to minimize stiffness. Certain ligament injuries will require special post-surgical protocols that are best performed by experienced therapists. This is why expertise is also important following surgery. Be forewarned: I am extremely picky about which therapist patients work with following elbow ligament repair or reconstruction. Simply put, not all therapists have the knowledge and experience to safely rehabilitate complex elbow ligament surgeries without stressing those structures, potentially compromising the results of an otherwise well-done surgery. A good therapist can often help regain full or nearly full motion and function following successful elbow surgery. A knowledgeable therapist combined with an experienced elbow surgeon and a motivated patient is the best possible team for restoring motion and function to the severely injured elbow. Coronoid Fracture (arrow) – The fragment may look small. But without surgical fixation, elbow arthritis will quickly ensue.